The characters of the two series have interacted in the past, both in "Vader Down" (last year's big crossover event) and in the Star Wars arc that followed "Vader Down". Aaron and Gillen also spoke with StarWars.com about The Screaming Citadel. "It starts with Aphra and Luke together, which is a pairing we didn’t really see at all in Vader Down, and that really drives this story. That’s probably been the most fun part for me, so far — reading what Kieron did with those two characters together and then carrying on from that. It starts with them venturing into a very dark and scary situation on a faraway alien planet and winding up in the clutches of a sinister alien queen. There’s symbiotes involved. There are Aphra’s two murderous droids and best-friend Wookiee, and then, of course, the cast of my book. Han and Leia and Sana Starros come running into the fray, as well, and there are several new villains who are at play." "It’s like, writing the entirety of the first issue is hilarious. [Laughs] They have such different life experiences. You know, she’s a little older than he is, he’s still naive and she’s a cynical monster. And they go back and forth and they tease each other and, occasionally, they push each other’s buttons. But there’s an underlying similarity. They’ve both lost their families. They’ve both had completely different responses to the horror of the Star Wars universe, the big tragedy, and the push and pull of that is very much the heart of the book. But really, it’s just funny. It’s just fundamentally funny to see them go at each other. Writing that entire issue was a joy, in terms of how they interacted and went back and forth and how they generally got on each other’s nerves. 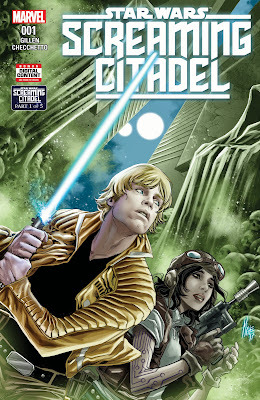 Aphra, to begin with, gets the best of Luke, and it kind of switches up as you go further into it"
The two go on to promise the story will be a Star Wars take on the gothic-horror genre. Gillen also promises fans that the crossover will explore the history Aphra has with Sana Starros (the character everyone thought was Han Solo's secret wife). "I think both of these crossovers that we’ve done, it wasn’t a situation where we were derailing what we were doing in our books, and then wedging in another story. They were both grown out of what Kieron and I were doing. It helps that he and I have been talking about Star Wars since Marvel first started doing Star Wars books, right? He and I were there together for the first retreat we did with Lucasfilm, and we’ve been plotting two books at the center of all this from the get-go. So it’s been really easy and organic, I think, to have these crossovers grow out of what we’re both already doing." You can read the entire interview with Aaron and Gillen over at StarWars.com. 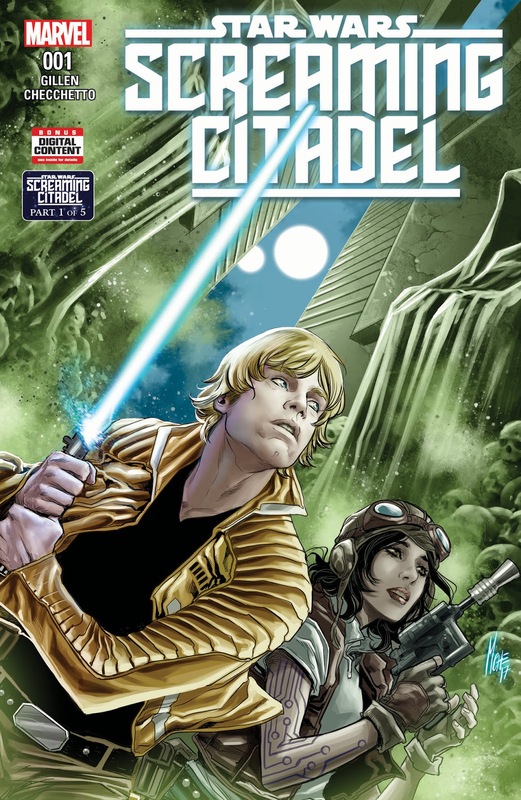 Star Wars: The Screaming Citadel kicks off in May with a special one shot written by Gillen before continuing on Star Wars #37 and Doctor Aphra #7.